If you’re looking for information for a visitor or need a gift for a loved one, or want to explore art and history close to home, you can venture down to Discover Portsmouth! Monday, April 1, Discover Portsmouth, reopened its doors. “We have so many exciting things happening this year, from the opening of exhibition, New Hampshire Folk Art: By the People, For the People to our Young Writer’s Contest to new walking tours and merchandise in our Museum Shop. 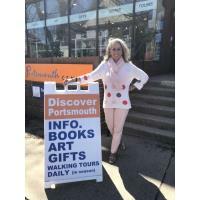 It is so much fun to put together a new package of offerings for our members and visitors every year,” says Robin Lurie-Meyerkopf, Manager of Walking Tours at Discover Portsmouth. New Hampshire Folk Art: By the People, For the People, an examination of folk art with New Hampshire connections, will have its members’ opening reception on Thursday, April 4 from 5:00 to 7:30. The exhibition opens to the public Friday, April 5 with extended hours, until 8pm, during Art ‘Round Town, and runs through Sunday, September 29. A companion exhibition in the upstairs gallery features contemporary folk art by members of the League of NH Craftsmen. The range of items includes furniture, textiles and sculpture, reflecting historic objects in the downstairs exhibition. Beginning Memorial Day Monday, May 27, visitors can also tour the John Paul Jones House and enjoy the popular exhibition, Overlooked and Undervalued: Three Hundred Years of Women’s Art from the Seacoast, which explores a range of forms of female artistic production from the past few centuries. The show opened in 2018 and will continue through the end of September 2019. In addition to another season of walking tours exploring the city’s past and present, Discover Portsmouth offers tours of its galleries during the Friday lunch hour and a Museum Shop stocked with a fine selection of locally-crafted items. For children and families, this season’s Folk Art-themed activities begins with cloth doll-making on Sunday, April 13 (9:30 to 12:00pm). Additional family programming includes Story Time, the 2019 Young Writer’s Contest and other hands-on programs. A series of Folk Art lectures begins on Thursday, May 16 with Deborah Child, art historian, lecturer, and independent curator speaking about “Trials and Tribulations: Researching Folk Artists Working in 19th-century New Hampshire.” Next, Paul D'Ambrosio, President of the Fenimore Art Museum and The Farmer’s Art Museum, in Cooperstown, N.Y. tackles “Folk Art and American Modernism” on Thursday, June 20. Gerald W.R. Ward, Curator, Portsmouth Historical Society will speak about “It’s A Small World: The Micro-Drawings of Rufus E. Patten of Candia” on Thursday, July 25. The final event, on Thursday, September 12, will feature a selection of League artisans giving a fast, fun review of their work during, “The League of NH Craftsmen: A PechaKucha Event.” All lectures are scheduled from 5:30 to 6:30pm. Please check www.portsmouthhistory.org for more information. Finally, be sure to mark your calendar for the Portsmouth Historical Society Annual Meeting (May 2), John Paul Jones House opening (May 27), John Paul Jones Birthday Party (July 14), John Paul Jones Jubilee and Silent Auction (September 5). Discover Portsmouth also hosts the headquarters of the NH Film Festival (October17-20), the annual “Its Pastel” juried show (October 25-November 30), our Portsmouth Advocates Awards Night (November 21) and the favorite 29th Annual Gingerbread House Contest (December 6-22).